Presented by Shop Durham. Get the most out of Durham with your Shop Durham card. 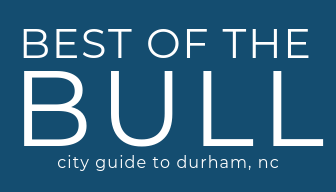 Get freebies and deals at hundreds of locally owned Durham businesses! Friends don’t let friends drink Starbucks. Durham’s coffee scene is just too good for that. Here’s the local coffee shops in South Durham you need to try. We are big fans of this funky cafe. The staff is always wonderful and willing to answer any questions I have about their unique drinks. They even roast their own beans. Notes: The space is surprisingly large and there are plenty of outlets to plug in. There’s a small kids play area in the back with a table and some chalk. Bypass Starbucks in favor of this local option behind Southpoint Mall. This place is everything you want in a coffee shop. Cozy, unique, great coffee, good people, custom mugs, and a beautiful atmosphere. Notes: You have to get a photo in front of their hand painted mural wall. You can find these shops all over the Durham coffee scene with three prime locations. They even roast their own beans and you can get their coffee at other local spots like Guglhupf and Pine Cone. The South Durham location is tucked away in the Woodcroft Shopping Center on Hope Valley Road. Notes: Be sure to check out their lavender syrup made in house. You’d be hard pressed to find another outdoor space that is this beautiful, has great coffee, and wi-fi to work from. One of the best patios in Durham. Notes: They have a gorgeous bamboo garden topped off with a water fountain and koi pond, tons of outdoor seating that is pet and kid friendly. Bull and Bean is a great spot for breakfast, brunch, and lunch any day of the week. We love that they serve Counter Culture coffee and if you want to grab an iced coffee, the ice cubes are made from coffee so your drink doesn’t get watered down. Score! A local staple for 25+ years, Saladelia has 4 locations around Durham. The staff is awesome and the food is great. Quality, taste and value are all outstanding. Their South Durham location is the original one off University Drive. Fun Fact: People think Saladeila is the the owner’s last name, but it’s simply a combination of “salad” and “deli” with the “a” added. Dulce Cafe is a cute local cafe that also serves up delectable desserts like gelato, macarons, cookies, éclairs, tarts, and more. They even look like works of art, too pretty to eat, but you’ll devour every bite once you taste them! Notes: They even have a great selection of lunch items, the turkey apple brie sandwich was amazing!